The Bootle Bum Trinket: Why Bootle? Some of my readers might be wondering why I have named the blog as I have. 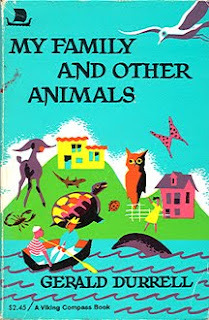 The name has been taken from a book called “My Family and Other Animals” by Gerald Durrell. In that book, Gerry had been given a boat for his birthday. Gerry had wanted to name it “The Bootle”, but his older brother Larry had wanted to call it "Bum Trinket". In the end, “The Bootle Bum Trinket” had been decided upon. In my family, we have shared personal jokes revolving around ‘bootle’ and ‘bum trinket’ ever since I was a baby. We have modified the words and given them a personal touch, and have used them as code words for each other. As a child I had considered the names to be my father’s invention, and had been very proud of them. I had been so sure of them being baba’s composition, that when I read the name in the book two years ago, I remained grief-stricken for quite a few days! When I was just about to create this blog, I had quite a bit of trouble coming up with a nice name for it. Everything I thought of turned out to be solemn and quite common, whereas I wanted this blog to be cheerful and out of the way. It was then that baba suggested calling the blog “The Bootle Bum Trinket”. Now that was bound to be an uncommon selection. I was all for it from the moment baba put the idea into my head. So unless I find a better, more uncommon name, “The Bootle” it will remain. Of course now I'm dying to ask you - what were those personal jokes around those words. I get that grief-stricken bit though. Hehehe (and that's supposed to be a long laugh)- modifying words and using them as code. That is priceless. Coming up with a title is a difficult bit...and it has to be like the baby bear's bed - 'just right'. Nice one this one Pupu. Very nice. Aah, that explains the mystery; thank you! And I can understand your anguish upon knowing that your dad was not the matermind behind your favourite family joke; as a child I used to think my parents knew everything. And by everything, I mean absolutely everything under the sun. It's lovely to hear from you. The blog is no doubt interesting to read. I still remember the stories you use to relate sometimes to me after class. Would love to hear some more. My apologies to those who had commented on this post, but whose comments are not shown. I had published them, but for some reason they seem to have vanished all by themselves! "Bootle" is the name of a small town in the English Lake District. "Bumtrinket" probably means a little decoration for one's behindparts. Just a silly name for the boat in the book.